Shimmering Skin Perfector is rated 4.8 out of 5 by 222. Reinvigorate your complexion with BECCA Shimmering Skin Perfector Liquid Highlighter, an ultrafine makeup liquid for the cheeks, jawline and bridge of the nose. Ideal for creating an airbrushed effect in moments, the feather-light formula is enriched with skin nourishing ingredients to support a natural complexion. Vitamins A, B, D and E are used to protect against environmental damage, while avocado oil adds suppleness and aloe vera calms the complexion. This skincare formula is designed as a cosmetic enhancement that also fortifies the complexion. You can choose to apply BECCA Shimmering Skin Perfector Liquid Highlighter in an even layer all over the face, or showcase certain areas such as the jawline and cheekbones. Smooth it on alone, or blend with foundation for fuller coverage. 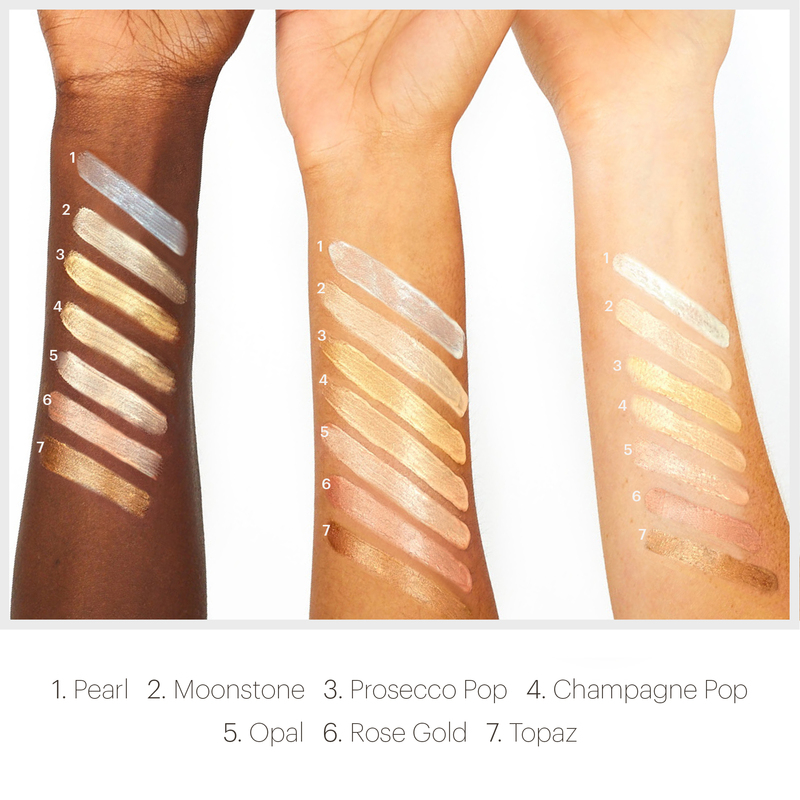 BECCA Shimmering Skin Perfector Liquid Highlighter is a brightener for the face which is easy to apply and helps create a flattering result on any skin type. • Apply Shimmering Skin Perfector® Liquid Highlighter evenly on face for an all over dewy glow or wear on high points of the face such as cheekbones and down the bridge of the nose. • For a super fresh and luminous look, mix Shimmering Skin Perfector® Liquid Highlighter with your favorite foundation and apply evenly on face. Finish by adding a thin layer of Shimmering Skin Perfector® Liquid Highlighter on cheekbones for a glowing complexion. Rated 5 out of 5 by Dehlin from beautiful illuminator I LOVE this mixed in with any foundation to give a wonderful glow that is not oily/ sparkly. It makes me look like a have great skin and I always get compliments. I have it in a few shades depending on the look I am going for. It feels light on the skin. It is reasonably priced especially for a large bottle. Can also be dabbed on the cheek bones for a subtle highlight. Rated 5 out of 5 by Jo30 from Beautiful subtle glow I have been using this Becca highlighter for several years now after the make up artist in Muswell Hill branch recommended it to me. I like to use this during the summer months in the day. I have shade opal which works brilliantly when you have a light tan (my is fake using tan-luxe drops) I use my fingers and pat on cheek bones, bridge of nose and a little below brow corners. It just looks natural and beautiful. I find it doesn’t show a lot in photos, so for events I choose Becca highlighting powder. The bottle is huge for highlighter and as I only use a tiny amount (less than pea size) it seems to be lasting forever! Rated 4 out of 5 by FPJG from Beautiful highlighter This gives such a beautiful finish, very much a natural shimmer rather than a glitter explosion & has great staying power too. This lasts forever as you get a tonne of product. I have repurchased the Opal shade several times. Love the product but I really hate the packaging. Taken a star off for it as it really does let it down. The lid has broken on each bottle of this I’ve had within the first month or so. I think the plastic is too brittle perhaps? Thankfully it’s a pump tube so not a total nightmare to have no lid but definitely not ideal! Received a travel size of this in a goodie bag & have to say I prefer it as it’s in a classic squeeze tube.